We’re happy to bring you this 12-minute, must-watch video commemorating the 100th Anniversary of Workers Comp. 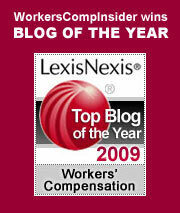 The video highlights progress in worker safety, treatment of injured workers and risk management in the past 100 years. In addition to telling the history of comp, it also features three visionary women who were instrumental in furthering health and safety of workers…one of whom witnessed the Triangle Shirtwaist fire. Until this clip, I did not realize the strong role that women played in this history. Kudos go to Sedgwick as well as to our colleague and friend Peter Rousmaniere. who wrote the script. This entry was posted on Tuesday, April 3rd, 2012 at 7:15 am	and is filed under History, Videos. You can follow any responses to this entry through the RSS 2.0 feed. You can skip to the end and leave a response. Pinging is currently not allowed.